New Delhi : Doctors at Fortis Hospital Shalimar Bagh recently managed a highly unusual and complex case where a patient, suspected of having a cancerous tumour, was instead found with 838 stones in her gallbladder. After a correct diagnosis was reached, the surgery was successfully conducted ensuring patient recovery. Ms Pushpahad been experiencing acute stomach pain along with intermittent episodes of fever. She was nauseated, feverish and in extreme pain when she presented herself at the hospital recently. She was advised to undergo an ultrasound and CT scan, the results of which suggested that she might be suffering from cancer of the gallbladder. Thereafter, a team of specialists led by Dr. Amit Javed, Consultant, Gastrointestinal Surgery, Fortis Hospital, Shalimar Bagh performed a meticulously planned and executed, two-hour laparoscopic procedure in January this year.The patient’s gallbladder was extremely inflamed and had grown to six times its original size. As per plan, this was a laparoscopic surgery wherein her gallbladder would be removed with part of the adjacent liver and sent for immediate pathological examination (frozen section). This was carried out with all necessary precautions to prevent abdominal dissemination and port site (surgical site) metastases. The gallbladder specimen was removed in a pouch to avoid contamination and spillage. However, post removal, when they opened the gallbladder to look at what was inside before sending it for biopsy, they discovered, much to the shock and astonishment of the doctors, that it was filled with several hundred small and large gall stones. In total, there were 838 gallstones! “Gallstones cause inflammation of the gall bladder and can cause severe pain, symptoms of indigestion and complications like blockage of the bile duct leading to jaundice, severe infection, and pancreatitis. They are also commonly found in patients with gall bladder cancer implying a possible causation. This patient was having only stones and her biopsy report was negative. Cancers of the gall bladder are very aggressive in nature and usually get detected only in the final stages of the disease since they present with vague symptoms which are not taken seriously. The only remedy to both gallstones as well as cancer of the gallbladder is complete removal of the organ,” said Dr Javed. “The Department of Gastrointestinal and Hepatobiliary Surgery aims to provide a comprehensive diagnosis and implementable solution to all gastrointestinal surgery- related issues. The ability to do so comes with a staff of skilled surgeons and their teams guiding the procedure at every step of the way. 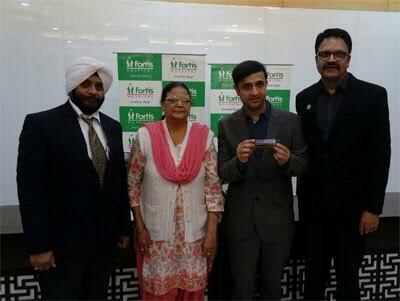 Fortis Shalimar Bagh has piloted several complex surgeries in the past. In this case too, we were successful in our endeavour,” said Mr. Mahipal Bhanot, Facility Director, Fortis Hospital, Shalimar Bagh. Gallstones are masses formed abnormally in the gall bladder or bile ducts from bile pigments, cholesterol, and calcium salts, in case of adults. Gallstones can also develop when there is too much cholesterol in the bile secreted by the liver. Some diseases. It is more common among women in their middle age group. The incidence of gall bladder cancer in north and central India is very high, and is commoner in women. Northern India is much more prone incidences of gall bladder cancer (GBC) than south India.